Johannesburg, 7 April 2019 – Employees are one of the most crucial investments businesses make. Without employees, businesses – particularly in the labour-intense metals and engineering sector – would cease to exist. It is against this backdrop that companies should continuously invest in ensuring that the environment in which employees operate is safe, so says Steel and Engineering Industries Federation of Southern Africa (SEIFSA) Chief Executive Officer Kaizer Nyatsumba. “Employers have an obligation towards their employees to ensure that not a single life is lost at the workplace, regardless of how hazardous the work environment is. In fact, the more hazardous the environment, the more caution employers need to exercise to ensure the safety of their workers. The injury or loss of even one life at a plant or at a site is one life too many and companies need to go out of their way to ensure that not a single life is lost at work,” Mr Nyatsumba said. 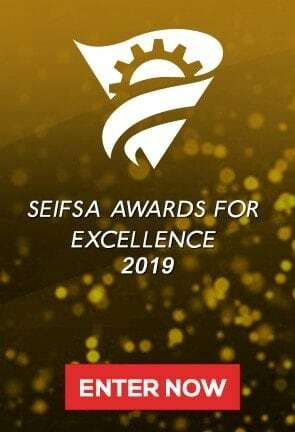 It is against this backdrop, among others, that SEIFSA established the SEIFSA Awards for Excellence to encourage and celebrate companies which take the health and safety of their employees seriously. To celebrate companies that go out of their way to invest in the health and safety of their employees, SEIFSA will present the Health and Safety Award of the Year to a company with the best legal compliance record in Health and Safety or the lowest Lost-Time Injury Frequency rate between July 2017 and December 2018. Along with the Health and Safety Award of the Year, the SEIFSA Awards for Excellence have six other categories.